The least complicated version of a risotto I have created and right up there as one of the tastiest. If you haven't cooked risotto before, try something as simple as this - herbs and bacon and mushrooms and cream and Parmesan. Heat the chicken stock, celery stalk, bashed garlic clove and some of the porcini mushrooms in a medium sized saucepan until it simmers. Over a medium heat saute the onion and minced garlic with a little bit of the minced herbs in 1 tbs butter and 1 tbs extra virgin. Add in the risotto rice and toss and toast for 2 or 3 minutes. Add in the wine and allow to mostly absorb. Add 2 ladles of the flavoured stock mixture at a time and allow to mostly absorb before adding the next, stir after each ocassionally. 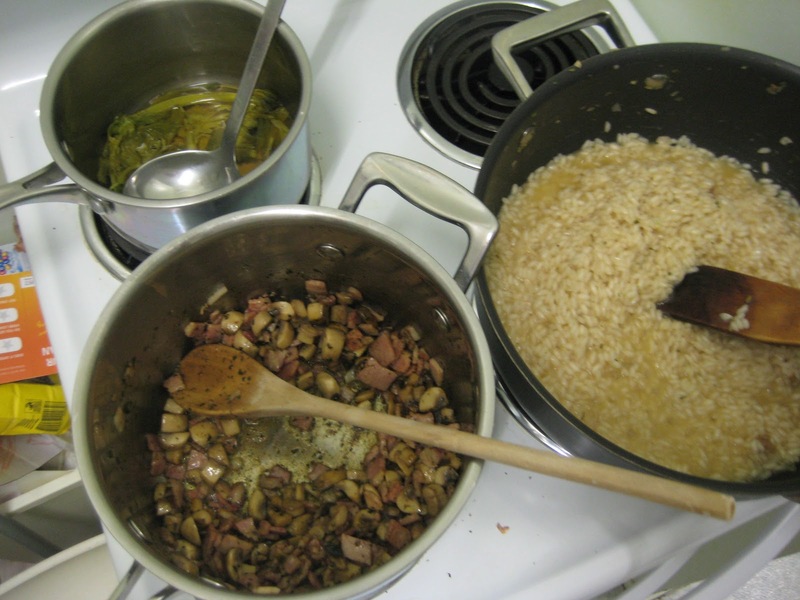 Continue until the risotto is mostly cooked (about 18 to 20 minutes). In the meantime, heat the remaining butter and extra virgin over medium and saute the chunked mushrooms, some porcini mushroom slices, garlic, minced herbs and bacon for as long as it takes to make the risotto. Stir the mushroom mixture into the risotto with the cream, Parmessan and some salt and pepper with the last ladle full of chicken stock. Add a lid to the risotto pan and allow to rest for 5 minutes.